Game Creek Bowl is full of snow already. 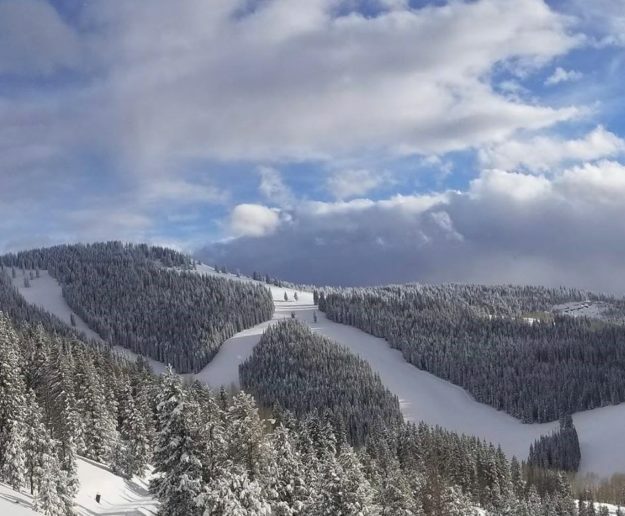 Vail opens on Friday, Nov. 16 (Vail Mountain Facebook photo). With early-season snowpack verging on 180 of average for this time of year, Colorado ski areas continue to open early. Aspen Mountain is the latest to open a few days early (now Saturday, Nov. 17) after both Breckenridge and Keystone did so earlier in the week. Now six ski areas — Eldora, Breck, Keystone, Loveland, Arapahoe Basin and Wolf Creek – are up and running full-time for the 2018-19 ski season, with a few more, including Vail, coming online next week. First, it’s Winter Park opening on Wednesday, Nov. 14, followed by Vail and Copper Mountain on Friday, Nov. 16. Aspen Mountain then opens early on Saturday, Nov. 17, after originally scheduling a Thanksgiving, Thursday, Nov. 22 opening. Purgatory is also opening Saturday, Nov. 17. The following week, several more ski areas get in on the action, including Beaver Creek on Wednesday, Nov. 21, and Monarch opens that same day. Crested Butte is scheduled to open on Thanksgiving, Nov. 22, along with both Snowmass and Telluride. Ski Cooper is opening early on Friday, Nov. 23. After a sunny, dry day on Saturday, another storm is set to clip Colorado with light snow and colder temperatures Saturday night through Monday. Then the rest of the week will see a drier, warmer period until another storm moves in Tuesday, Nov. 20, according to Opensnow.com. ASPEN SNOWMASS, Colo.—Nov. 9, 2018— Aspen Mountain will open for daily operations Saturday, Nov. 17, five days prior to the resort’s scheduled opening date. Snowmaking operations began Nov. 1 and have continued at a steady pace throughout the last week due to cold temperatures at night. Alongside snowmaking, recent storm cycles have delivered up to 20 inches of new snow on Aspen Snowmass pushing the snowpack above average. Ticket offices are open at the base of Aspen Mountain, at the Snowmass Base Village Gondola and at the Four Mountain Sports downvalley outlet seven-days a week. Details about lift ticket pricing, terrain, restaurant operations, ski school, and more will be announced in the coming week. Snowmass is scheduled to open Thursday, Nov 22. Aspen Highlands and Buttermilk are scheduled to open Saturday, Dec. 8. For more information about Aspen Snowmass, visit www.aspensnowmass.com or call (800) 525-6200. Follow Aspen Snowmass @aspensnowmass on Twitter and Instagram, or at www.facebook.com/aspensnowmass.